This post was originally published on our sister site VRSource.com. Ubisoft has released a new game for the Daydream platform called Hungry Shark VR. You take on the role of a shark in a large underwater environment full of caves and shipwrecks, among other things. There are a few different objectives available including eating as much as you can, racing against time, and rescuing other sharks that are in danger. You start off as a bull shark but have the option of choosing between different species including the great white shark as the game progresses. There are quite a few enemies you’ll have to face along the way including stinging jellyfish and hostile divers. Those of you interested can already try out Hungry Shark VR. The game will set you back $4.99 on the Google Play Store and offers additional in-app purchases that will help you make progress a lot easier and faster. You can get it below. 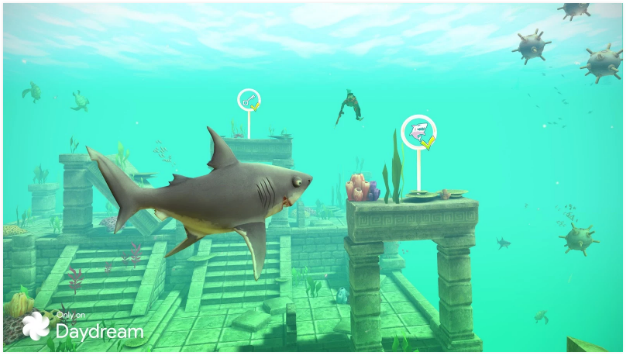 Hungry Shark VR is the second game Ubisoft has released for the Daydream platform in the last month or so. In April, the company launched the Virtual Rabbids: The Big Plan game, which is also available for $4.99. 10 best Google Daydream apps!